Investors don't have to settle for P&G's sluggish sales and profit growth. The consumer products industry is bracing for another year of sluggish global growth and brutal competition. Those dynamics mean that Procter & Gamble (NYSE:PG), despite its improved portfolio and lower cost structure, might again post disappointing operating results. It is targeting 2% organic sales gains in 2017, which would mark an improvement over the prior year, but still implies a third straight year of market share declines. Sales growth is for the past complete fiscal year and excludes currency impacts and brand sales. Sources: Company financial filings and S&P Global Market Intelligence. Like P&G, 3M is seeing its growth improve at a stubbornly weak pace right now. Organic sales are projected to be flat in fiscal year 2016, compared to a 1% dip the prior year. The growth should accelerate solidly from there, as management forecasts 2% gains for 2017. The conglomerate enjoys significantly stronger profitability than P&G. In fact, operating margins across each of its five core business divisions were 22% or better last quarter. Its consumer products segment was a standout performer during the period, with sales up 4% and operating margin north of 26%. By contrast, P&G posted a 3% uptick and profitability of 21%. 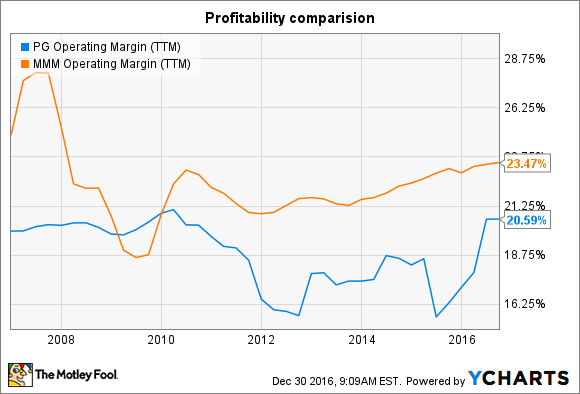 Not only does 3M's operating margin trounce P&G's 20% figure, but 3M's profitability has been consistently higher and more stable over the last six years. As a result, the company has more cash to invest in the business and to return to shareholders -- without needing to resort to the types of major brand divestments that P&G has. Johnson & Johnson has a large consumer products division that is enduring weak growth, roughly comparable to P&G's. Global brands like Listerine, Aveeno, and Nicorette have helped keep sales moving in the right direction, but that rise amounts to just 1% over the last nine months. The sluggishness was more than offset by strong results in its two bigger divisions, though. Medical device sales rose 3% last quarter and the company's pharmaceutical segment spiked higher by 11%. Bottom line, organic sales rose 6% in the third quarter, roughly double P&G's pace. While both companies admit that innovation is critical to the health of their business, Johnson & Johnson is faring much better on this score. Thanks to the $9 billion it dedicates annually to research and development, the healthcare giant consistently churns out new blockbuster brands. Over 25% of sales last year came from products that were launched over just the past five years. P&G, meanwhile, hasn't introduced a new billion-dollar franchise in over a decade. P&G's slight valuation premium of 23 times earnings compared to 21 for Johnson & Johnson and 22 for 3M, reflects the growing optimism that the operations are about to take a sharp turn higher. After all, the company has whittled its brand portfolio down to just the fastest growing, most profitable products at the expense of only a small portion of revenue. At the same time, its cost burden is far lower than it was just three years ago. Yet rather than bet on the potential for faster growth or better margins, investors might prefer buying businesses that already demonstrate these important characteristics, especially when they come at a discount to P&G's valuation.